Happy birthday, Sidney Poitier. If my father were alive, he’d be a week shy of his 92nd born day. May he continue to rest in peace. As a line in the old song goes: 'I never knew YOU at all' but I was six years old when I saw "To Sir, with Love" at the Roxy Cinema on Walpole. See, my Mom worked as a typist in the Roxy, so she got discounts on documentaries and live shows featuring the Afro National band with hits such as “Temedi” (Happiness). 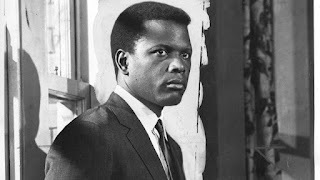 Poitier’s eyes in one of the best movies of the sixties are as memorable as National’s songs. A steely glance held up in a ramrod suit, Poitier played a young, gifted and black engineer who took up teaching in the Docklands, where decades later my mom (who just turned 81) would live briefly during the war in Sierra Leone.